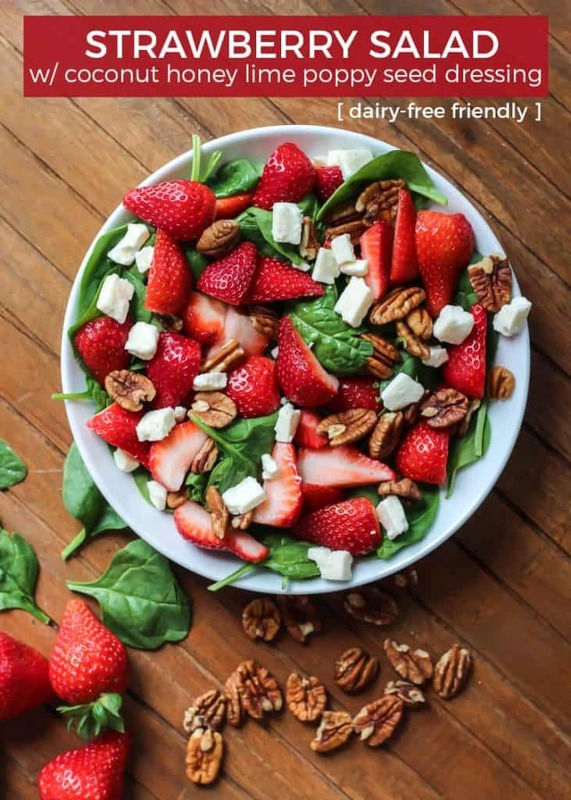 This Strawberry Salad is a great addition to any meal! Made with a coconut milk based honey lime poppy seed dressing. Gluten-free, vegan-friendly. So it’s official: STRAWBERRY WEEK just happened here on the blog and I didn’t even know. We had not one, not two, but THREE recipes this week featuring my beloved strawberries. 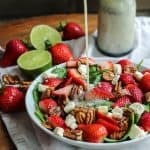 Monday I shared an Avocado Chocolate Fruit Dip –perfect for dipping strawberries into–Wednesday it was strawberry crisp, while today we’ve got a delicious strawberry salad. It was a total accident but a happy one at that. I don’t think I could ever tire of strawberries. Hopefully we’re on the same page because it is June and peak strawberry season, after all. It comes and goes so quick we must take advantage! I feel like summertime is a constant reminder to truly take things in. To enjoy the days as they are. To accept both the hot (often humid here) weather and the thunderstorms. To take advantage of the long days and spend more time with one another. To get outside and enjoy nature and the blue skies before it gets cold and gray again. 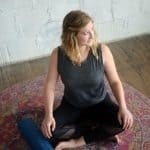 Even though the days are longer, these months do not last long, and I’m finding that summer teaches us to be more present. To appreciate what we have when we have it. It is alllll about perspective. And finding joy in the little things. This is our first summer in our new house and I often catch myself thinking “Gosh, we are really lucky to have our own place.” Not only our own place but to be living in a community on a lake. And a field out back that gives us a little bit of that “countryside” feeling, if you will. Drew and I grew up in different settings– I grew up in a subdivision while he grew up with land just outside of town. I wasn’t opposed to living in the country, but I also didn’t want to be too far away from grocery stores, shopping, etc. Thankfully where we ended up was really a happy medium for both of us. 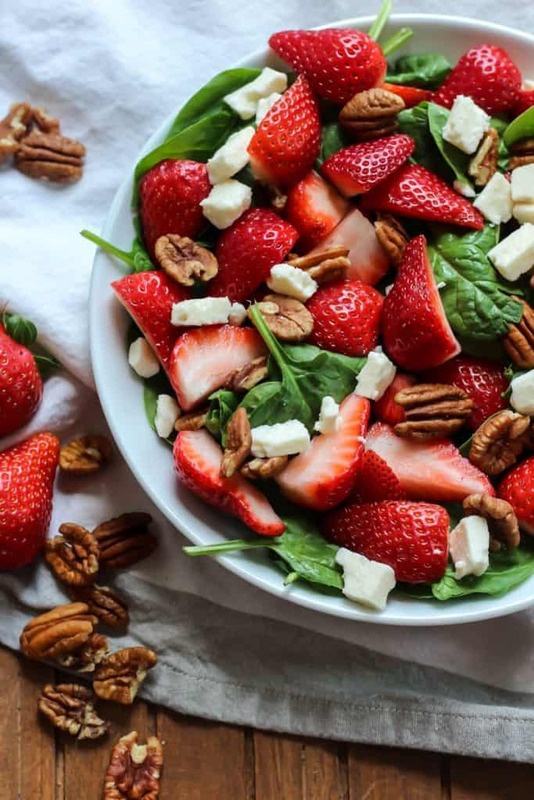 But back to summertime and this strawberry salad. It’s quite lovely on its own and would be a great salad to bring to a little BBQ gathering. But throw on some grilled salmon or chicken and you have yourself a killer lunch salad. Oh oh, I also made you a new dressing recipe! Well, it’s not super new. But I re-created the honey lime dressing from a fan favorite Southwest Quinoa Power Bowl and threw in some poppy seeds for fun. 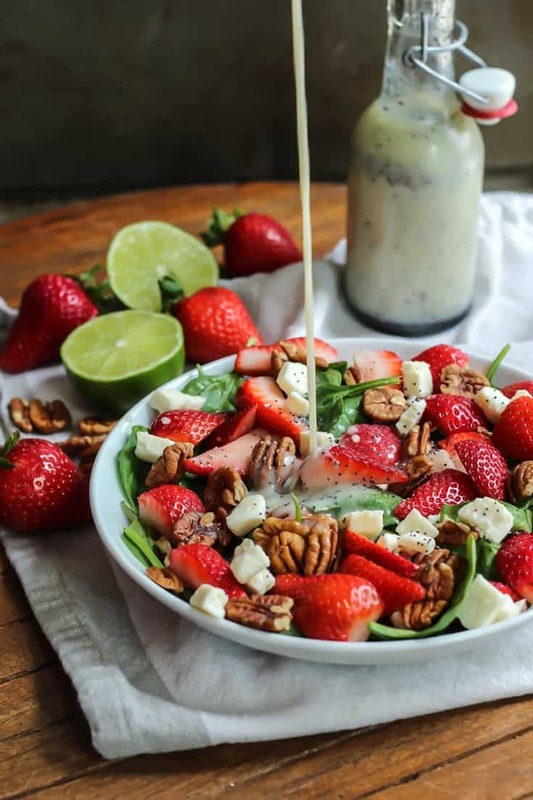 I always hear from readers saying how much they love that honey lime dressing so I thought I would share it again with this salad. It is a great combination with the pecans and feta. Just leave out the feta if dairy-free! The honey lime dressing can be whisked together in a bowl or salad dressing cup – super simple! 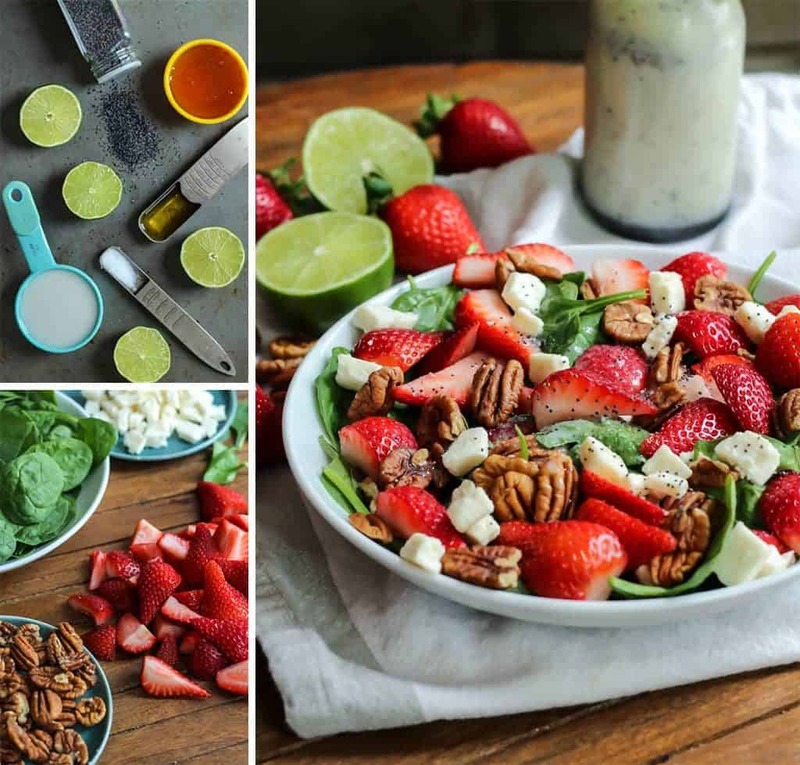 And then the strawberry salad is just 4 easy ingredients. Can’t wait to make this for friends and fam. 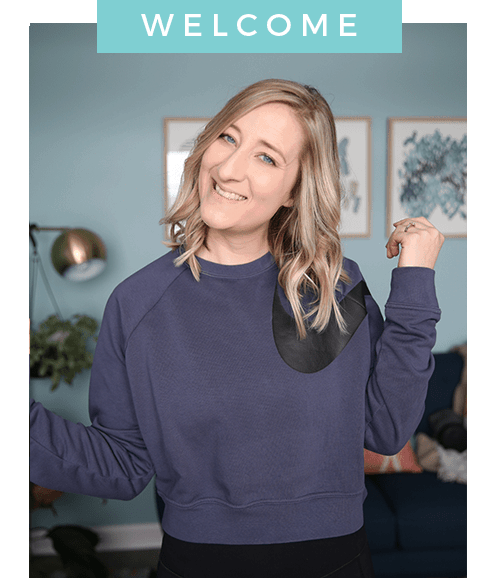 Let me know if you make it too! 1. 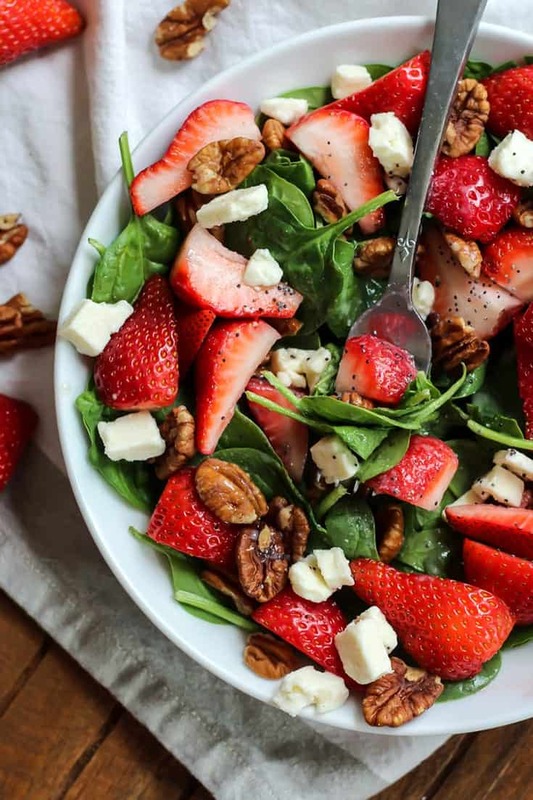 Toss spinach, quartered strawberries, feta, and pecans in large bowl. 2. To make the dressing: combine all of the dressing ingredients in medium bowl and whisk until combined. You can also use blender cup with immersion blender, or even a small food processor and pulse 2-3 times to combine. 3. Toss salad with dressing, or serve separately. Enjoy as is for a side salad, or serve with your favorite grilled protein for a light and healthy meal. *full-fat coconut milk will yield the best texture for the dressing. Store dressing in airtight container in fridge up to one week. Separation may occur once dressing has sat in fridge, just shake before serving. I love the reminder of enjoying moments, enjoying gifts as they come, because that makes each day such a blessing. I want to focus on the blessings that I do have instead of complaining about it being too hot or mosquito bites. One of those things is the blessing of so many sweet amazing food blogger friends who make delicious recipes that always give us fun things to bake and cook and share with others. Can I use any other type of mil if I don’t have coconut milk? Hi Shana – You can use another milk but the canned coconut milk will give the dressing a little bit of a thicker texture. Thank you for this recipe! I had some leftover coconut milk, and wanted a healthy version of poppyseed dressing. I did lessen the amount of honey and salt, and added a little bit of apple cider vinegar. It is good! Thank you so much for your comment, Alexis! I’m glad you liked it!